I've been hearing a lot about cauliflower rice lately that I just had to give it a try. To my surprise it was super easy & so good! 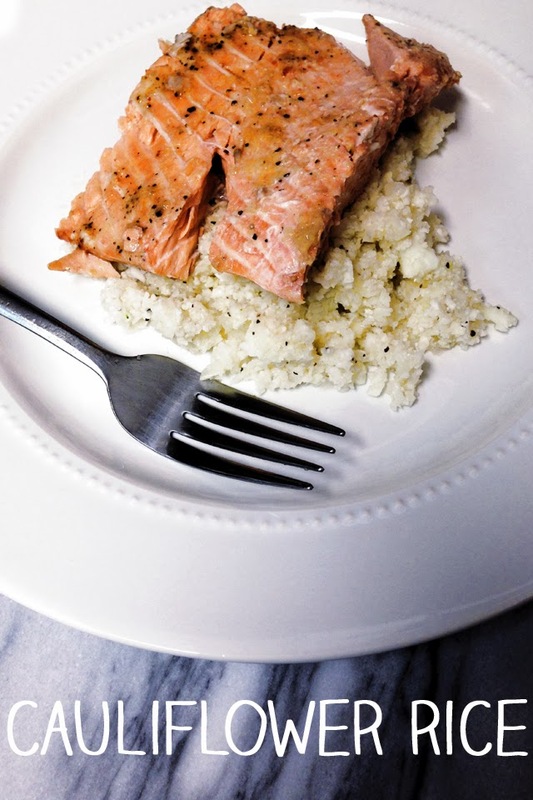 We placed grilled salmon on top of our cauliflower rice & it made for a super delicious & healthy dinner. It tastes so decadent you forget that you're eating something that's good for you. Place the cauliflower in a food processor and pulse until the cauliflower is the size of rice or cous cous. In a saute pan, heat the olive oil, onion and garlic for a few minutes until translucent. Add the cauliflower rice and cook for approximately 5 minutes, or until completed heated through. Add salt & pepper to taste. This looks delicious! I haven't tried doing it yet, but have been meaning to for awhile now - definitely pinning this recipe! !